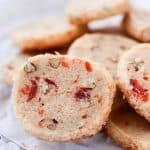 This Santa’s Whiskers Cookie Recipe is always a hit with the kids and is the perfect cookie for Holiday Cookie Exchanges! In a large mixer bowl beat butter till softened. Add sugar and beat till fluffy. Add milk and vanilla and beat well. Stir in cherries and pecans. Shape into three 7″ rolls. Roll in coconut to coat. Wrap and chill for several hours. Cut into 1/4″ thick slices. Place on ungreased cookie sheet. Bake about 12 minutes or until done. Remove and cool.